The UK’s armed forces are making final preparations before joining the Omani military for what will be their largest joint exercise for 17 years. Exercise Saif Sareea 3 will take place across Oman during October and November, and is set to involve more than 4,000 British personnel. It will be the third time Britain and Oman have come together to run a joint exercise, with the previous two taking place in 1986 and 2001. The overall aim of the event is to test the UK and the Sultanate’s ability to operate together in austere conditions through the deployment of a Coalition Joint Task Force. According to the Ministry of Defence, next month’s exercise will culminate in a “firepower demonstration”. 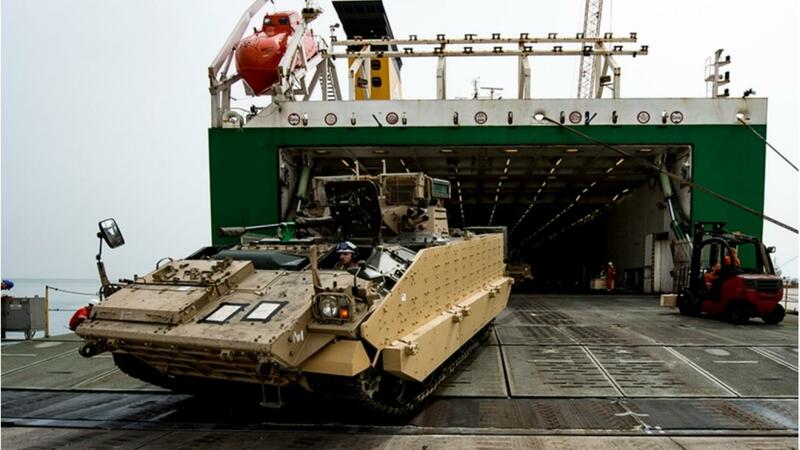 British armoured vehicles arrived at Duqm Port in Oman last month aboard two roll-on roll-off ships, which left the UK from near Southampton in late July. Each vessel was laiden with a cargo of more than 3,500 tonnes, made up of vehicles including Warrior armoured fighting vehicles, Scimitar CVRT (combat vehicle reconnaissance tracked) and Bulldog personnel carriers. Operating alongside the UK’s ground vehicles during Saif Sareea 3 will be Apache attack helicopters of 664 Squadron, 4 Regiment Army Air Corps. Based at Wattisham Flying Station in Suffolk, 664 Sqn spent the end of last month at a weapons range in Lincolnshire carrying out day and nighttime exercises using both CRV7 rockets and 30mm cannons. Major David Mills, Officer Commanding 664 Sqn AAC, said: “Exercise Saif Sareea is a fantastic opportunity which will showcase all of the Squadron’s equipment, capabilities and people.